We discussed this earlier, and a reader sends this my way. I have been involved in shooting probably 100 bear or more in my life so I have seen what works well and what does not. You would expect that bigger is better, but I would argue against that logic. Many magnums (IE: 7mm Rem. Mag, 300 WSM, 28 Nosler, etc.) are what people show up with because of this thought. These rounds tend to penetrate through and through and then dump the rest of their remaining energy (typically a lot) into the tree or hill behind the bear. There’s a good time and place for them, but it is not hound hunting. On the other side of the coin, I have seen a bear shot with 44 Mag, 45-70 Gov. and 32 Special, to name a few. All of these do a much better job at killing these predators. Why? Because the round is so much bigger in diameter, the shock of the bullet going into the animal is much more traumatic. Also, because they are going slower, they will actually be caught within the animal, capturing 100% of the energy that the bullet left the barrel with, transferring into killing power. With this logic, I knew that the 5 rounds of Hornady 450 Bushmaster with a 250 gr bullet from the Ruger would be devastating on a black bear. If you disagree, that is okay, but personal experience has really proven this to me. I have absolutely no doubt this round will kill any game in North America within 100-200 yards. Beyond that I would want something with a higher BC to prevent the loss in velocity and to ensure an ethical kill. Then again, my eyes can’t see 400 yards anyway. But this hunter clearly likes the heavy bullet with the high exit muzzle velocity. He also seems to like the Ruger AR 556. 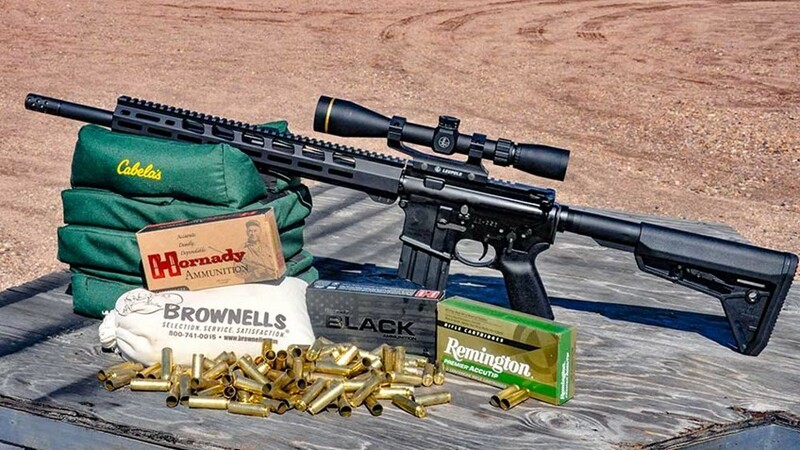 Shooting Illustrated has a good review of the Ruger AR 556 in 450 Bushmaster. I do find this quite an interesting cartridge. It’s also informative that Leupold came out with a scope specifically designed for this cartridge, called the VX-Freedom 3-9x40mm Bushmaster. It’s also reasonably priced. I’d like to know if any readers have a Ruger AR 556 (the make, form factor, materials and gunsmithing will all be about the same regardless of caliber, so any input is appreciated). Mr. Guns and Gear thinks the make is nice but they should Melonite the barrel.